ChemSee’s portable detection kits for explosives and explosive precursors include a customized set of detectors for explosives and/or explosive precursors. All portable detection kits form colorwhen the target explosive or precursor is present. They are simple to use, even for unskilled personnel. All materials in the kits can be transported and disposed of without restriction or certification. Their small size (10x7x3″ or less) and weight (470g or less) make these portable detection kits ideal for use in the field. 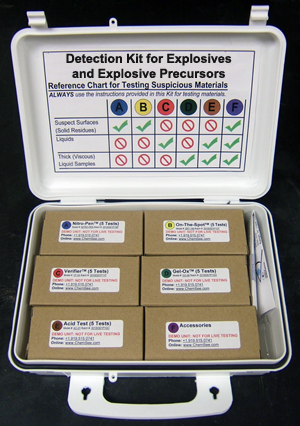 Contains six detectors for nitrate-based explosives, nitramines, home-made explosive precursors (flammables and strong oxidizers), full color instructions and all materials required for sample collection and testing. Contains three detectors for nitrate-based explosives and nitramines, full color instructions and all materials required for sample collection and testing. Contains detectors for home-made explosive precursors (flammables, strong oxidizers and fuels), full color instructions and all materials required for sample collection and testing.